Appraisers are finally being heard. 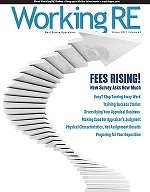 As a result of grass roots complaints by appraisers about diminishing appraisal quality in industry blogs, publications, the general media, and in a formal appeal by a coalition of appraisal organizations, the Federal Housing Administration (FHA) announced several important policy changes intended to increase accountability and due diligence in the appraisal process. The changes take effect January 1, 2010. Other important issues addressed in the Letters are the validity period for appraisals (reduced to four months); the allowance of a second appraisal to be ordered under certain circumstances when a borrower switches from one lender to another, geographic competency and appraisal portability standards. You can find these three important Mortgagee Letters at WorkingRE.com, Sidebar: FHA Mortgagee Letter 2009-28, 2009-29 and 2009-30.